In this Sept. 21, 2018, file photo, U.S. Supreme Court Justice Ruth Bader Ginsburg participates in a panel discussion at Columbia University Law School in New York. 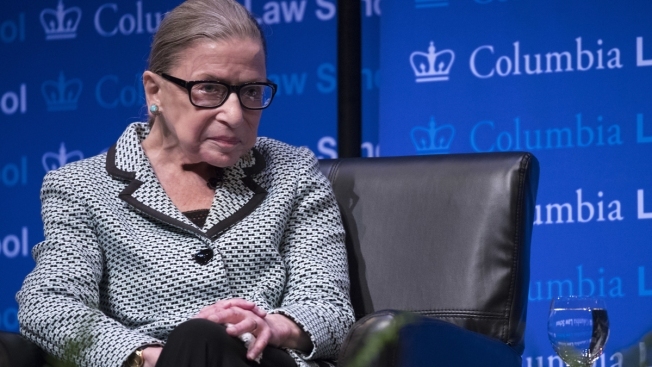 Supreme Court Justice Ruth Bader Ginsburg has three broken ribs and is being monitored in a D.C. hospital after falling at her office at the court Wednesday night, officials said Thursday. The 85-year-old went home after the fall but went to George Washington University Hospital Thursday morning after experiencing discomfort, according to the court's office of public information. "Tests showed that she fractured three ribs on her left side and she was admitted for observation and treatment. Updates will be provided as they become available," the office said in a statement. The court is holding a formal investiture ceremony Thursday for its newest justice, Brett Kavanaugh, at 10 a.m., in which Kavanaugh will take an oath. President Donald Trump is scheduled to attend, and the other justices on the court were scheduled to attend as well. There are no more cases being argued this week. Friday is a conference day for the Supreme Court, in which justices meet to discuss cases argued earlier in the week and vote on petitions to hear their case.